Twenty four years ago today, the Number 4 reactor exploded at Chernobyl. It was the worst nuclear accident the world has ever seen. Two people were killed in the explosion. Thirty-seven died of acute radiation sickness soon afterwards. According to engineers who were there, dozens were killed while building the reactor’s concrete sarcophagus. More than 2,000 villages around Chernobyl were contaminated by radioactivity. More than 330,000 people were evacuated and relocated. Statistics predict approximately 270,000 cancers and 93,000 fatal cancer cases will be caused by Chernobyl. At least three million children required medical treatment. The effect on the health of the survivors and their children has been devastating: accelerated ageing, cardiovascular and blood illnesses, psychological illnesses, chromosomal aberrations and an increase in foetal deformations. Photography has always been a powerful tool of communication. It is one of the new media forms that helps change perception and even the structure of society. 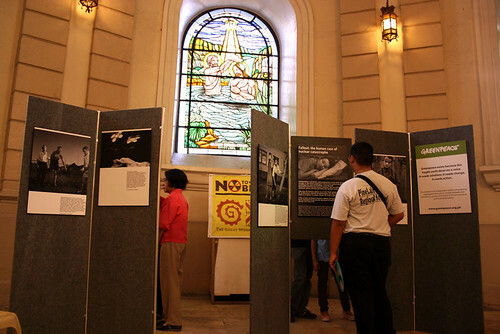 This is proven by the photo exhibit we put up last Feb 28, 2009 at Malate Church. The exhibit stands with photos of the aftermath of the Chernobyl disaster, taken by a reknown Dutch photographer, Robert Knoth, where the main focus was on people whose lives have changed drastically and dramatically because of nuclear power. As the parishioners viewed the photos, they were captured by the depressing condition of the subjects. They really took time reading the captions while parents explained to their children the grim effects of the nuclear disaster shown in the photos.